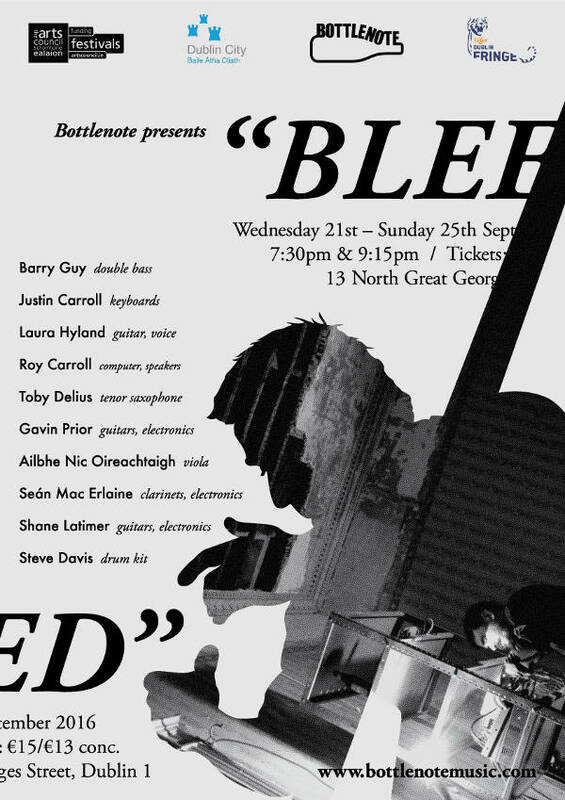 Developed at Bottlenote's landmark show BLEED at the Dublin Fringe in 2016, Orgone Accumulator wildly reinterprets that classic ensemble – the organ quartet. Bringing together musicians based in Dublin, Belfast, Berlin and New York this group redraws the lines for what an organ combo can be. 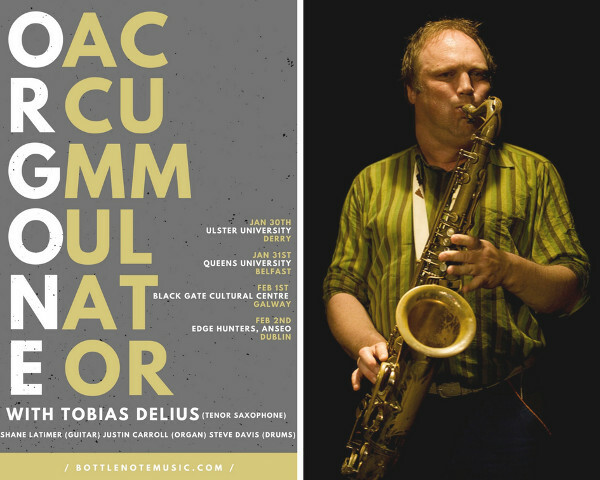 “Delius’s mastery of the tenor is sprawling, but the deep, warm richness of his tone is a constant, recalling the breathy sensuality of Ben Webster, the agile gravity of Sonny Rollins, and the pinched phrasing of Archie Shepp …” - Peter Margasak, Chicago Reader. Footage from Cairde Sligo Arts Festival 2017. 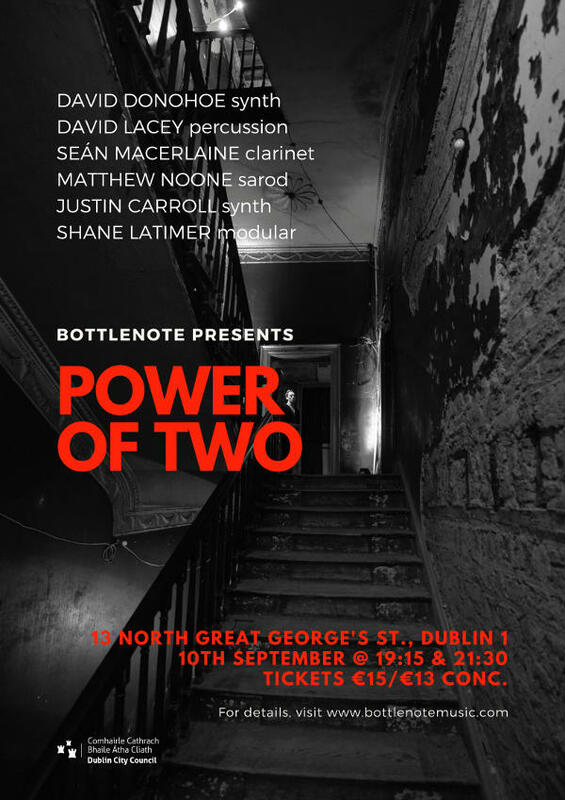 The Bottlenote music collective reaches deep into the Irish scene of improvising musicians to present an evening of new music in the dilapidated surrounds of an abandoned Georgian residence. Vintage keyboards jostle against woodwinds, modular synthesizers drone over six string and a saxophone player is heard through the old porous walls. Join Ireland's finest improvising performers in a space that few eyes have enjoyed since its nineteenth century glory days. Performers: David Donohoe, David Lacey, Seán Mac Erlaine, Shane Latimer, Matthew Noone and Justin Carroll. A magical, site-specific experiential evening of new and improvised music featuring leading Irish and International musicians. A sell-out show at Dublin’s Fringe Festival, Bottlenote Music ’s The Walls have Ears will move outside Dublin for the first time. The Sligo event will take place in ‘Breda Murphy’s House’, No. 2 John Street. Audiences will be led from one room to another to experience a series of quiet improvisations, explosive sets and moments of magic. Performers: Phil Minton, Seán Mac Erlaine, Shane Latimer, Claudia Schwab and Jennifer Walshe. Sound of Silents presents a programme of short silent films accompanied by new improvised scores. The selection has a distinct German flavour and includes a newsreel purportedly documenting the Irish Rising of 1914; the first transatlantic flight by Irish and German pilots (1928); portraits of German-born artists Irina Brady (1943) and Imogen Stuart (1955); and scenes from the Aran Islands by ethnographer Heinrich Becker (1940s). The music, curated by Shane Latimer of Bottlenote, will feature performances by Seán MacErlaine and Ailbhe Nic Oireachtaigh joined by musicians from the Ruhr area of Germany, saxophonists Julius Gabriel and Florian Walter, and electronic artist Achim Zepezauer. This programme is supported by Dublin City Council MusicTown 2017 and by the Goethe-Institut, Irland and Jazz Offensive Essen. BLEED animates an abandoned Georgian house, creating a reverberating, pulsing space. The audience is led from room to room each occupied by a musician, guided by light design which highlights the patina and atmosphere of the house. A live collaborative tape piece is used, a technique of recording each performance and replaying that recording throughout the house as the next performance is occurring. With ten performances this creates an increasingly rich, layered ambiance where past decisions inform subsequent ones, with each musician adding to the composition over five days turning the entire four storey house into a huge instrument. Tickets can be bought now! Bottlenote, in association with Improvised Music Company and Note Productions present String Theory, a new international festival of contemporary electric guitar. 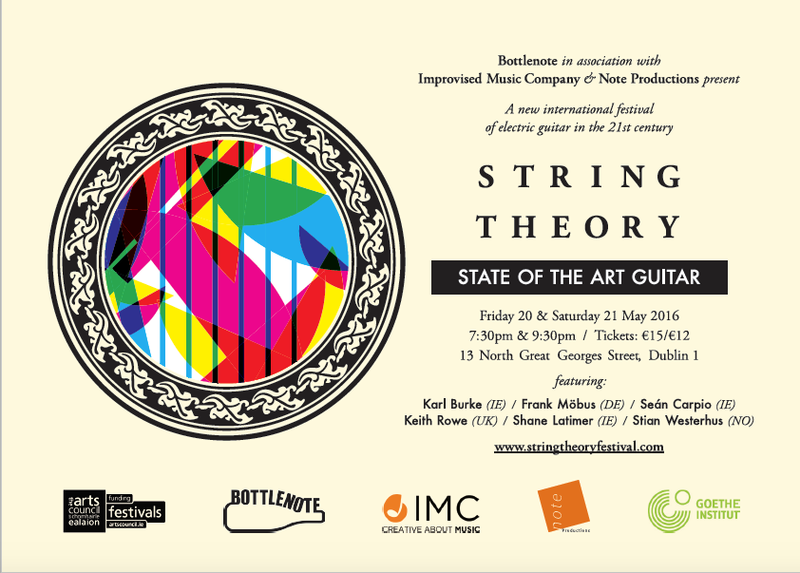 The inaugural String Theory festival will present leading international exponents of contemporary improvised guitar alongside their Irish. Performances on guitar by percussionist Seán Carpio, sculptor Karl Burke and Shane Latimer alongside Keith Rowe (UK), Stian Westerhus (Norway) and Frank Möbus (Germany). Our international artists bring great individuality to the table at String Theory. Keith Rowe (UK) is a free improvisation tabletop guitarist, known for his skillful and unconventional guitar technique, producing sounds described as dark, brooding, compelling, expansive and alien. Norwegian guitarist Stian Westerhus’ hard experimental style balances raw expressiveness, virtuosity and melodic instinct, utilizing his Norwegian heritage as well as taking inspiration from metal and noise with a recent focus on challenging the electric guitar alone on stage. Internationally recognised German guitarist, Frank Möbus has a signature sound, which involves feeding his guitar through an arsenal of effects, generating spherical tones or howling groans in rock style. Along with this international talent, String Theory will present three exceptional Irish musicians of great importance to contemporary guitar music in Ireland today. Shane Latimer, leader of group OKO and founder of Bottlenote festival, performs improvised music with guitars, synthesizers, various preparations and electronic processing, with an active interest in electronic programming and DIY synth building. Seán Carpio’s practice incorporates song, sound and improvisation with numerous collaborations in contemporary art contexts, performing, exhibiting and undertaking residencies in a number of prestigious art venues. Karl Burke is a visual artist and musician with an interest in the poetics of space and has produced a number of film and video art soundtracks. “The exposed internal fabric only adds to the enchantment of the building” - Totally Dublin. As with previous Bottlenote event The Walls Have Ears, String Theory will feature the abandoned beauty of 13, North Great George’s Street. This beautiful Georgian residence will host the six improvising musicians with audience led from room to room, experiencing quiet improvisations, explosive sets and moments of magic. Strictly limited capacity event with four performances over two nights, at 7:30pm and 9:30pm. All musicians will perform at all four performances. 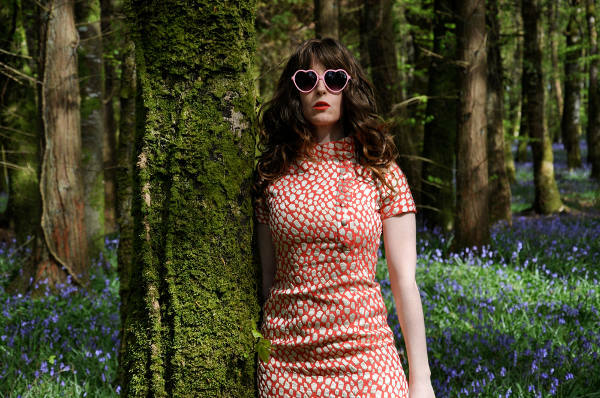 Reuniting Bottlenote with the treasures of the IFI Irish Film Archive, Sound of Silents presents a new programme of silent films, dating from 1897 to 1970, accompanied by six musicians working between the fields of Irish traditional, jazz and electronic music. Seán Mac Erlaine (woodwind/electronics), Seán Carpio (percussion/guitar/voice), Jack McMahon (turntables), Eoghan Neff (fiddle) and Shane Latimer (guitar/electronics) will improvise solo and ensemble accompaniments to the programme which takes Dublin city as its theme. 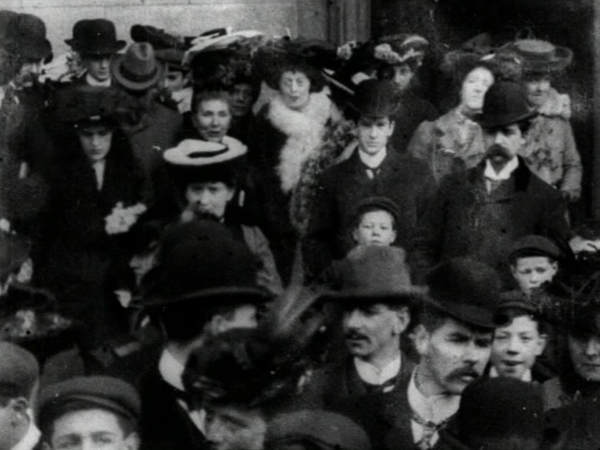 A selection of factual and fictional films, many not seen before in a public arena, includes the earliest moving images of Dublin filmed by Alexander Promio for the Lumière Bros in (1897); remarkable scenes of inner-city church-goers at St Francis Xavier’s Church and the Pro-Cathedral in 1901; a sweeping panorama of College Green in 1902; wry commentary on the streets of Dublin from US comedian Will Rogers (1927); a day in life of the Masonic Girls’ School in Ballsbridge (now the Clayton, formerly Bewleys Hotel) in the late ’30s; a rural idyll filmed by amateur enthusiast Conway Maxwell in Lusk in the late ’30s; and an enigmatic drama about a boy whose life is transformed at the Holy Ghost Youth Club in Dun Laoghaire in the early ‘70s. Presented in association with MusicTown 2016. 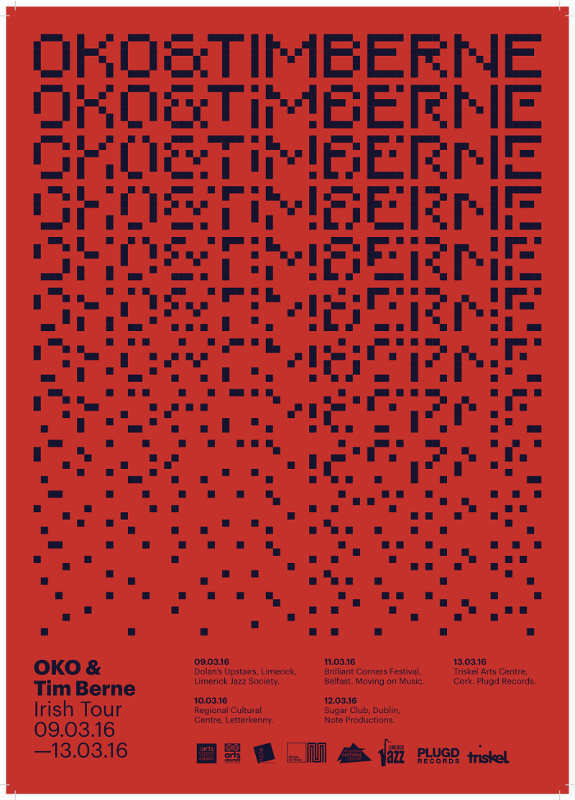 Renowned Irish improvisers OKO have teamed up with uncompromising musician and prolific composer Tim Berne, and will tour new works in five venues through Ireland in March 2016. Since he moved to New York City in the mid-'70s, alto and baritone saxophonist, composer, and bandleader Tim Berne has been an important member of that city's creative music community; he asserts a strong and singular musical personality throughout his diverse and absorbing works. 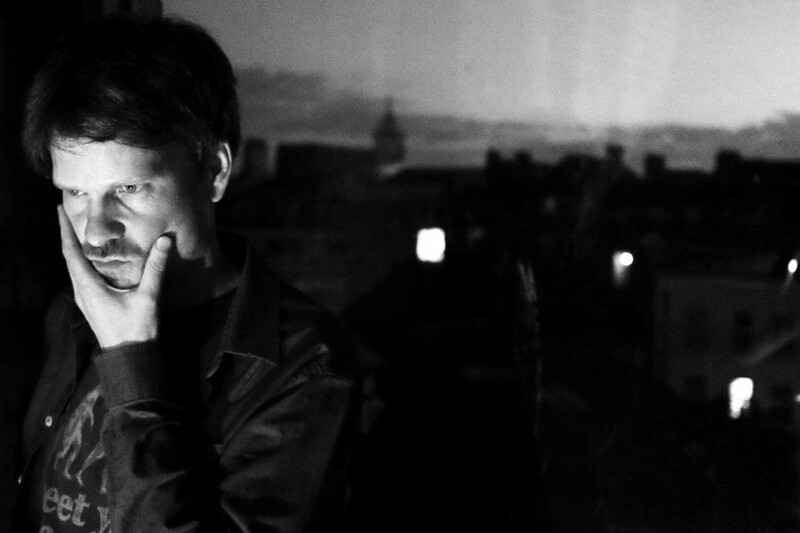 He has released a significant body of work over the decades spanning dozens of critically acclaimed recordings, being a unique and separate musical voice since his first forays into free jazz. 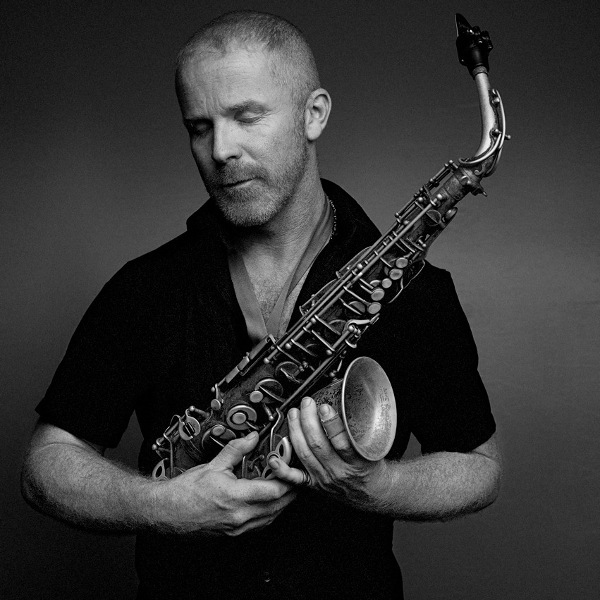 His inclusion on this tour is a major coup for OKO and for jazz in Ireland in general. To have a musician of such high quality and vision to perform throughout the country in collaboration with native musicians is an exciting prospect. 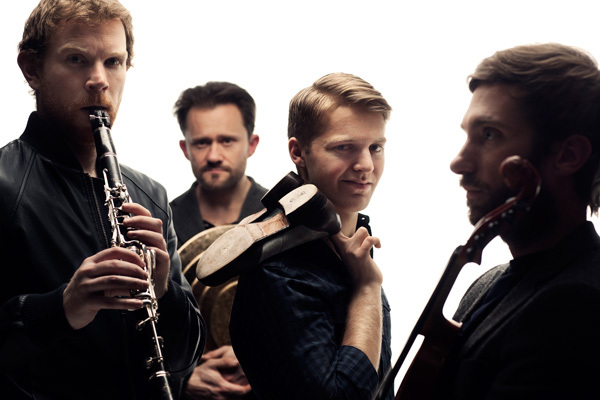 Irish group OKO present high-fidelity improvised music coaxed from an array of acoustic and electric instruments, transcending genre boundaries to offer a fully immersive aural experience. They released their debut album 'I Love You Computer Mountain' on Diatribe records in March 2014 to much acclaim. Bottlenote and Note Productions present Hayden Chisholm. Hayden Chisholm is today considered one Europe’s most distinctive and innovative voices on the saxophone, working extensively with artist Rebecca Horn, and cross-genre musicians Jaki Liebezeit, Root70 and David Sylvian. This Dublin performance will feature a screening of his short film Sysiphus Runs as well as short films documenting the making of his new 13 CD Box set Cusp of Oblivion which includes several new recordings produced in 2015 by the national radios of Germany and Switzerland. ￼ Already hosted at a number of European screenings, Sysiphus Runs is a new take on the myth of Sysiphus and is shot in the Tramuntana Mounatin range of Mallorca. Hayden will also give a solo performance with Saxophone and Sruti Box as well as a performance of the piece Finn Again Wakes using texts from James Joyce's Finnegans Wake. As a special guest Seán Mac Erlaine will join Hayden on bass clarinet and electronics. IFI and Bottlenote present The Sounds of Silents. Bottlenote presents The Walls Have Ears in The Tiger Dublin Fringe, September 9, 10, 11. 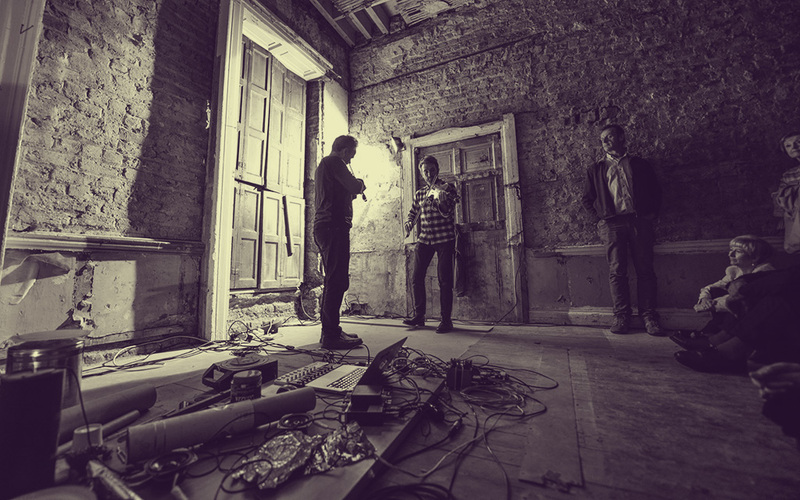 A site-specific promenade of improvised music in the atmospheric surrounds of a gloriously dilapidated Georgian residence. The audience, led from room to room experiences quiet improvisations, explosive sets and moments of magic from leading improvising musicians. A leading figure of European improvised music and film scores, Dutch cellist Ernst Reijseger (Werner Herzog, Winter & Winter) is joined by acclaimed Irish musicians Seán Carpio (guitar, electronics), Shane Latimer (guitars, electronics), Seán Mac Erlaine (clarinets, processing), and Justin Carroll (keyboards). Lighting and atmospheres are by designer John Crudden. Tickets for these six limited capacity concerts are now on sale. 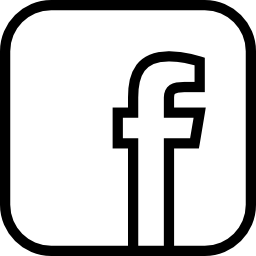 Follow us on facebook or twitter for the latest announcements. The innovative minds of Bottlenote Music have dug deep into the rarely seen archives of the IFI to bring you an audiovisual treat never experienced before. Five musicians, all luminaries in their fields, ranging from trad to electronic, will perform improvised scores in accompaniment to a selection of silent films from the IFI’s back catalogue, as well as some non silent films that were never soundtracked. The five in question will create a melodic merger between woodwind, percussion, turntables, fiddle and electric guitar. The performance will breathe new life into the films and offer a new perspective of enjoyment through the musical accompaniment. A real treat for fans of old film and improvised music alike. Featuring Eoghan Neff (fiddle/electronics), Seán Mac Erlaine (reeds/electronics), Shane Latimer (guitar/electronics), Jack McMahon (aka DJackulate, turntables/reeds), Sean Carpio (percussion/guitar). Bottlenote Festival 2014 presents The Walls Have Ears. Friday 26th and Saturday 27th September. 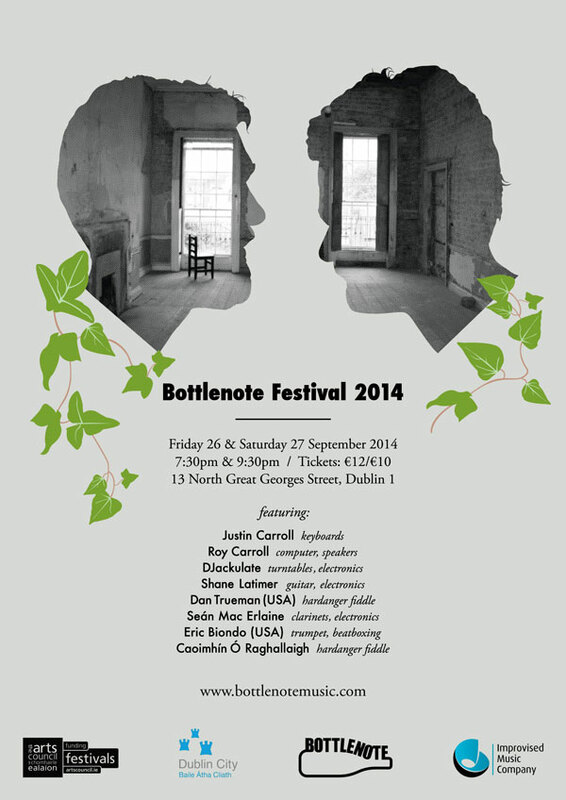 We're delighted to announce that Bottlenote Festival will return to the atmospheric surrounds of the gloriously dilapidated Georgian residence on North Great Georges Street for the 2014 edition. The Walls will once again have ears, with four performances taking place over two nights in late September.The audience will be led from room to room throughout the house to experience quiet improvisations, explosive sets and moments of magic. Bottlenote 2014 artists include Eric Biondo (USA) – trumpet, beatboxing; Dan Trueman (USA) - hardanger fiddle; Caoimhín Ó Raghallaigh – hardanger fiddle; Roy Carroll (GER) – computer and prepared speakers; Djackulate – turntables; Justin Carroll – keyboards; Shane Latimer – guitars, electronics and Seán Mac Erlaine – woodwinds, electronics. You can hear the new OKO album streaming here. 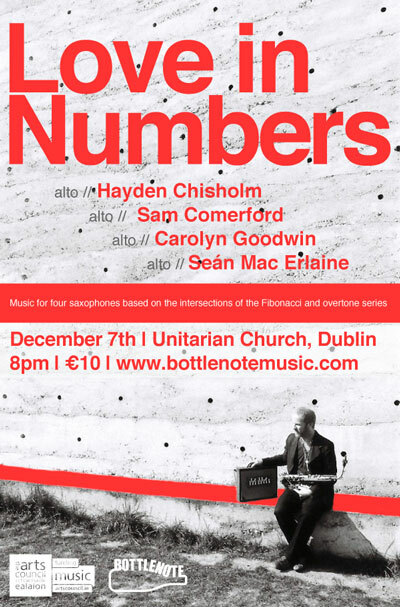 Bottlenote’s final production of 2013 is an acoustic presentation of unique music for four saxophones in one of Dublin city’s most atmospheric churches, including a world premier of a new work. Hayden Chisholm is today considered one Europe’s most distinctive and innovative voices on the saxophone, working extensively with artist Rebecca Horn, and cross-genre musicians Jaki Liebezeit, Root70 and David Sylvian. In 2013, Hayden Chisholm released a 13 CD box set encompassing several of his most important recorded works from the last decade. Love in Numbers is the first work on the first CD. This project sees Chisholm working with three Irish saxophonists on four very special pieces, one of which will receive its world premier in Dublin, that make states of consciousness and natures golden ratio manifest in sound for Irish audiences. The first, Love in Numbers is an extraordinary piece of music for 4 saxophones that brings two creative principles together: the overtone series and the Fibonacci series. Performed by alto saxophonists Hayden Chisholm, Sam Comerford, Carolyn Goodwin and Seán Mac Erlaine, Love in Numbers will make manifest the sound of the Fibonacci row and the golden proportion in its most pure sonic manifestation, hidden within the overtone series. The Fibonacci series is a surprisingly common growth series found throughout nature, often called the Golden Ratio, while overtones are the sounds within the sounds, the harmonic ladder which extends upwards infinitely in perfect whole number ratios. At the musical point where these two series meet, we hear the sound of a beautiful, endlessly extending spiral of ever-alternating sixths with each interval leading perfectly to the next. Receiving its world premier in Dublin is a new work for alto saxophone quartet entitled Alpha-Theta, which explores the states of consciousness arising from various brain wave frequencies. By translating brain wave frequencies into octaves, and then arranging them for the group according to harmonics, Chisholm translates brainwave activity into musical expression, in particular the state between waking consciousness and sleep is explored in this work. Compact Ragas for Saxophone Quartet, another new work by Chisholm, uses the sruti box and 4 alto saxophones to audibly portray various Hindustani Ragas in a compact form. Lucas River is a quartet piece using the Lucas numbers, similar in design to Love in Numbers, but featuring the luscious bass clarinet of Seán Mac Erlaine in the lower register. Tickets are available on the door from 7:30pm. The Bottlenote Festival 2013 brings the cream of contemporary folk musicians together with Dublin's most respected improvising musicians for two very special nights of music: Friday September 27th and Saturday Septembe 28th. Friday night’s concert, presented in partnership with IMC, sees the launch of the highly anticipated debut album from This is How we Fly in Temple Bar’s Button Factory. Since forming in 2010 this unique group have caused more than a stir across Europe with their spellbinding live shows combining percussive dance, electronics and deeply expressive music. The festival culminates on Saturday 28th September with two showings of The Walls Have Ears a very special site-specific event on North Great Georges Street, Dublin 1. Making the most of a stunningly dilapidated, and abandoned, Georgian residence, the audience will be led from room to room throughout the house to experience quiet improvisations, explosive sets and moments of magic. This is a strictly limited capacity event and will run for two shows at 7:30pm and 10pm. This is How we Fly. Album Launch concert. Admission price includes complimentary copy of the new album on CD, recorded in Stockholm, March 2013. The Walls Have Ears features improvised sets and collaborations from Petter Berndalen (SWE) – percussion; Justin Carroll – keyboards; Nic Gareiss (USA) – percussive dance; Caoimhín Ó Raghallaigh – hardanger fiddle; Shane Latimer – guitars, electronics and Seán Mac Erlaine – clarinets, electronics. 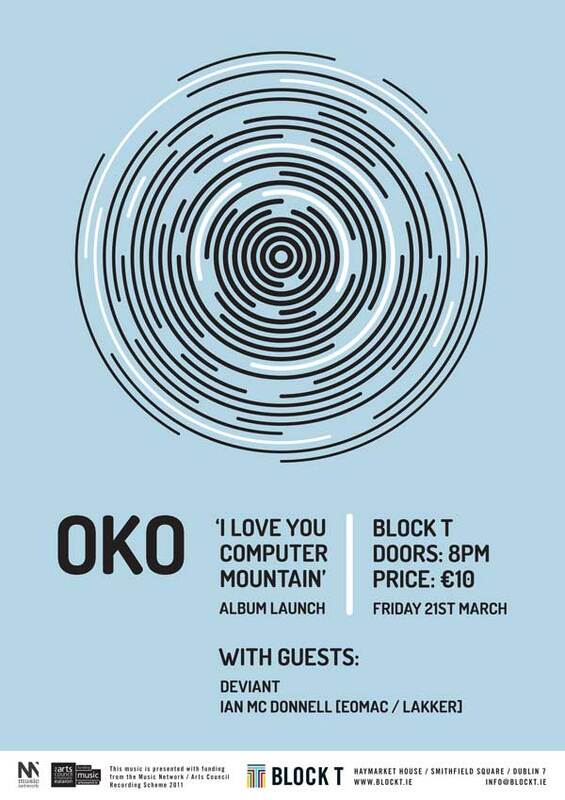 Dublin's OKO continue their sky-rocketing trajectory with an appearance at 12 Points! Festival in Project Arts Centre 13-16 February. Shane Latimer - guitar; Shane O'Donovan - drums; Darragh O'Kelly - keys; Djackulate - turntables. A music shifting from lush synth-drenched sculptures to both tight and loose grooves, singing melodies, robust scratching and liberated soloing drawing on a wealth of influences such as krautrock, vintage TV shows, free jazz, noise, dub, drum ‘n’ bass, dubstep, musak and more. Thanks so much to all the great crowds for Bottlenote Festival 2012. Thanks too to our funders The Arts Council and Dublin City Council, our venue partners BLOCK T, asquared marketing, The Improvised Music Company and all our friends! "A no-holds-barred celebration of beautiful noise. It’s a defiant stand against the “safeness” of mainstream commercial music, providing musicians and audiences with the space (literally and figuratively) to get past their preconceptions in an environment that buzzes with creative energy... 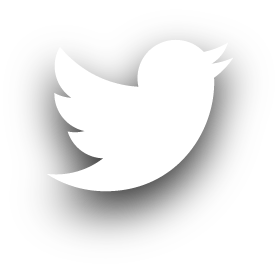 In fact, no-one knows what to expect – that’s the idea." - The Irish Times, November 2012.